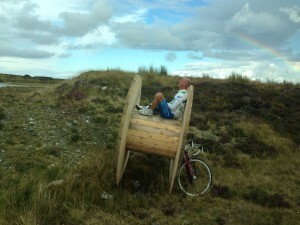 Some of us stayed at the Inchnadamph Hotel, and some in the hostel across the field. The owner of the hotel recognised us from two years ago, bought us a round of drinks, and although our deal was continental breakfast he was up cooking full breakfasts at 06:30, so we set off well fed. I will make a donation to recognise this generosity. We were riding in honour of Rebecca Clark. I met Rebecca and her Mother at the recent CBTR event. Susan was our designated rider. Here is what she had to say: ’Rebecca is a remarkable girl, who has gone through so much, but is thankfully still with us and still smiling. Her story crystallises the complexity of dealing with brain tumours, given the difficulty of distinguishing cancerous from healthy tissue. And many survivors have to live with deficits. As we have cycled, I have been surprised by the number of people who have brought their stories to us. It brings to life how prevalent and devastating this disease is. Developing treatments to improve the lives of children like Rebecca is fundamentally important’. Today was a really tough one. At 75 miles, it was not our longest, but over that distance we climbed 6,000 feet, and there were many climbs which were long, steep and energy sapping, especially when we faced headwinds. Even with fresh legs we would have found this hard, let alone with 1,200 miles behind us. This was a mind over body day. You see a climb coming (like the 16% hill 10 miles from Tongue that went on for about three miles) and think, how am I going to get up there? You climb trying not to look at your Garmin, because the miles turn over so slowly, or look at the summit, which approaches so slowly (and anyway might be a false summit). When your legs are burning and you feel you are running on empty, you think of all those who have supported you, and you think about the difference these funds could make to the prospects of many children. You grind on and breathe deeper. That gets you there, but it is punishing. We had a lot of those climbs today. Chris J’s group were out at 07:30, Chris R shortly after, then I left at 08:00 with Nick, Esteban, Doug, Andy, David W and our leg rider Bob Bayman (with three large stags gambolling in the background). Very quickly we were in to a long pull up to followed by a long fast descent. That descent was pretty scary: the combination of incline, sharp bends, unpredictable cross winds and a rough surface called for extra care. We took our first stop in Scourie, which was more or less closed, so it had to be a van stop. From there we headed for Durness, our third corner. It was a battling 25 miles, but ended with a long descent through a wide expansive landscape which reminded me of the glen where the final scenes of ‘Skyfall’ play out (but that was Glen Etive). Pretty well everyone was in ‘The Oasis’ for lunch, and pretty well everyone stoked up on baked potatoes (with assorted fillings). It is 30 miles from Durness to Tongue. I again set off on this stage with the same group I had started out with, though that gradually broke up. We were lulled into a false sense of security. Most of the first half is around a huge sea loch with spellbinding views, and the weather could not have been more different from when we set off. When Doug, Nick and Esteban broke off at 10 miles to take some pictures and fluids, I remember commenting that we had already covered 10 miles and there were only 20 to go. Shortly after that, the final third of our climbing kicked in, and over the final 15 miles or so, there were three huge climbs, on one of which I got a puncture, which put some distance between those who had just been ahead and me, Nick and Steve. Eight miles from Tongue there was a dramatic change in weather conditions as heavy rain moved in. We were soaked top to bottom (literally). Run off on the final descent to Tongue made riding conditions treacherous, as we struggled to hold the bikes back. We got through that, and by the time we got to Tongue itself, it was bathed in early evening sunshine (and swarming with midgies). We were cold. 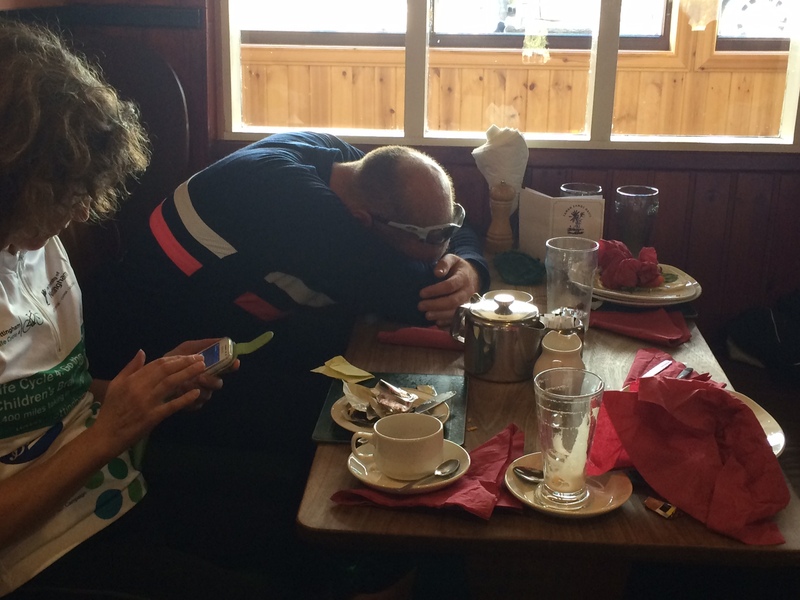 So a day everyone found hard; even Doug fell asleep over lunch. But all arrived safely at The Tongue Hotel, where David R and Ottilie were also staying and joined us for dinner. During and after dinner, there was a Life Cycle 4 photo competition, with one submission each and one vote each. Steve’s ‘Last of the Summer Wine’ pic took it. We also had a musical performance which Steve, Susan and Andy composed and sang, as a dedication to the Support Team. It was well crafted, and a nice touch (and cost us £20 each to listen to). A lot of the chatter this evening was inevitably about tomorrow, and the final run to John O’Groats. At 65 miles it is shorter than today, but we still have quite a bit of climbing to do, and the weather forecast is not good. Over lunch Svenja asked how Susan (Greenaway) was getting to John O’Groats. When I had explained she said: ‘Aw, she must be really looking forward to getting you back’. Before I could reply Nieves interjected: ‘We’re really looking forward to her getting you back’. Thanks, Nieves. Also over lunch, Bob Bayman came to our table to enthuse about the scenery. Susan’s response was: ‘Bob, you are way too cheerful; if you do not go away I will kill you’. Before dinner there was a short discussion about drinks – likes and dislikes. Nick commented: ‘I don’t drink whisky’. Me too, Nick. Finally, I am simply inundated with offers of images for the Life Cycle calendar, genuinely spoilt for choice. 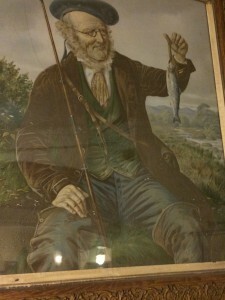 But I was delighted to arrive at our hotel in Tongue and find a portrait of David W, so I have included that. (I think David W will need his own calendar). Our 75 miles takes the total to 1,315 miles. One more day to go. Just from the way the blog is written, this sounds like the toughest day so far. 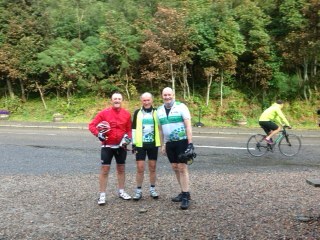 No doubt a function of the 1200 miles in the bag and steep climbs. But, as I write this, you’ll be on that final leg. 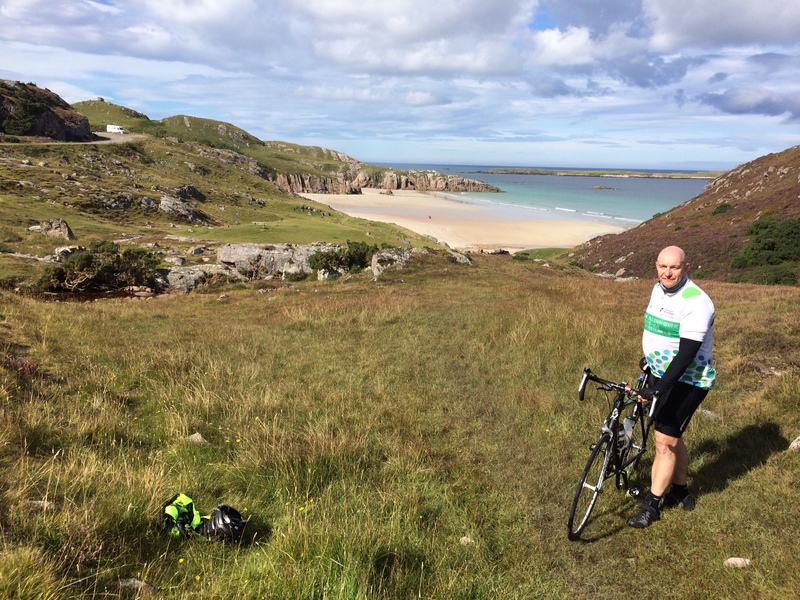 Good luck with the final 65 miles – looking forward to reading the blog tomorrow. Take care all – and good luck! Fantastic effort by all – nearly there! Looking forward to seeing everyone back tomorrow. That sounds a really tough ride. Huge congratulations to you all for coping and dealing with the uphill climbs, the treacherous descents and the massively changing weather conditions. There is a real feeling of anticipation in Nottingham about tomorrow’s events at Lakeside – and of course about welcoming the Lifecycle 4 team back to Nottingham and to the university. Great work everyone. Nice to have the shorter distance but I guess you could have done without some of those climbs. Still, at least the rain held off till the end of the day. But you are almost there and there’ll be a well deserved celebration and a well deserved rest coming your way! Keep going! The climbs and adverse weather have clearly made this a challenging leg. Thought for today: a quote from Barry McCarty.. Wind is just a hill in gaseous form…. Still, something you could have well done without on this penultimate day. You’re all doing amazingly well. Nearly there! I know this is attached to the wrong day but just wanted to congratulate you all. as I hear you have all made it, An amazing feat of endurance! Hope that you are all feeling elated. How many of you are cycling to work tomorrow? Congratulations to you all on an incredible achievement. Hope you all have some time to take it all in and enjoy some relaxation. An immense journey which we can’t begin to comprehend the stresses and strains of both mentally and physically. Well done and look forward to seeing you all tomorrow. I am managing to keep up with the blogs despite incredibly erratic internet access on holiday – unfortunately I have to go to the pub to get them, it’s a hard life!! Sorry I can’t be with you at the community day to say well done but huge congratulations to all on both the ride and the funds raised through your immense efforts! It’s been great to have an insight on a daily basis, but good grief that sounds like one heck of a journey. Extraordinary achievement all round from everyone involved. Thinking about everyone and wishing you a safe return. Massive congratulations to all of you on completing Life Cycle 4! What a challenge you have had the last couple of days but you have stayed strong and now you can celebrate your amazing achievement. The amount of money you have raised for Children’s Brain Tumour Research is just outstanding, you should all be so proud. Really looking forward to welcoming you all back later today. Fantastic effort – weather, climbing, midges and all. Nearly there now. Hope the weather is kind to you.